If you’re looking for a protective shipping solution for your Panasonic TV screen, look no further! Our Panasonic TV flight cases have been carefully designed to offer optimum protection to your Plasma, LED and LCD screens throughout transit and storage. Our Panasonic TV travel cases are available in a variety of sizes and are made bespoke to suit your Panasonic screen model. Our Panasonic screen road cases are available in a single, double or triple configuration to suit your needs. Our Panasonic shipping cases are hard-wearing and durable and provide your screen with protection and security throughout shipping and storage. We can manufacture our Panasonic screen flight case to suit any sized Panasonic screen. 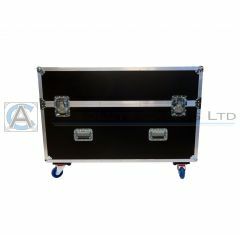 If you can’t find the right size screen road case; please contact us to discuss your requirements.